Rising energy prices and dependence on insecure supplies of foreign petroleum have led energy consumers and energy policymakers to seek methods to use energy more efficiently. Industrial cogeneration has frequently been seen as such a method. By generating electricity in conjunction with the production of steam for industrial processes, less energy is used than when process steam and electricity are produced separately. Most recent U.S. energy policy studies have spoken favorably about the potential for cogeneration.' Some specific studies have indicated opportunities to replace central station electric power generation with industrial cogeneration capacity, and, in the process, to reduce domestic energy consumption substantially. 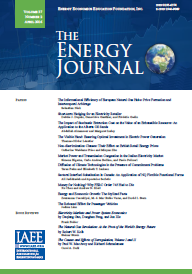 Proceedings - Is Cogeneration Still Industry's North Slope?